The first letter was sent to Mary, queen of Scots at the opening of her trial at Fotheringhay on 12 October 1586. It was written in French. 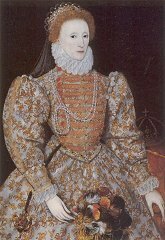 Four days after Mary’s execution, Elizabeth sent the second letter to Mary’s son, King James VI of Scotland. In it, she asserts her innocence in his mother’s death. Although she signed the warrant for Mary’s execution, Elizabeth tore it up. Another copy was signed, and – before the queen could change her mind yet again – Burghley and others upon the council sent if off. Elizabeth’s life was in constant danger while Mary lived, as numerous plots attested. Her councilors were determined to keep her safe. As for Elizabeth, she was understandably torn between protecting her throne and taking the life of a fellow sovereign, even one she did not respect or like. The second warrant was sent from London on 4th February, and reached Fotheringhay on the following evening. On the 7th the Earls of Shrewsbury and Kent, who were in charge of the execution, warned Mary to prepare for death on the following day. On the 9th news of the execution reached London, and was received by the Queen with surprise and horror. She openly raged against her councilors; her capable secretary Davison, who had given her the second warrant, was sent to the Tower.